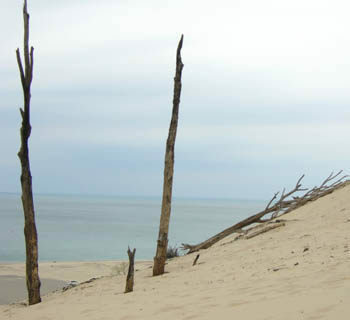 Michigan's famous sand dunes begin at Warren Dunes State Park. The 1,952-acre unit is the first unit along Lake Michigan, located just 12 miles north of the state border in Berrien County. It's a Michigan park, but its dunes are well known throughout the Midwest. More than 80 percent of the park’s visitors are from outside the state with the vast majority arriving from Illinois and Indiana. The attraction is 3 miles of sandy Lake Michigan shoreline and the dunes that border it. Near the water the dunes are wind-blown and high with several that rise 200 feet above the lake. They range from Mt. Fuller and Pikes Peak at the south end of the park to Mt. Edwards, a mostly wooded dune at the north end. 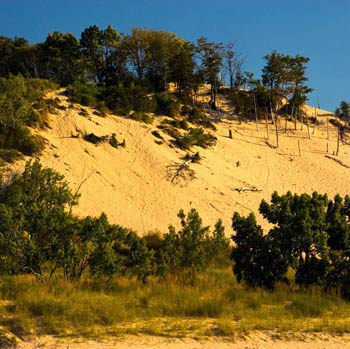 Thousands climb these mountains of sand each summer for an excellent view of Michigan's southwest corner. The most noted dune, however, is Tower Hill, the highest at 260 feet. During the mid-1970s this hill became a haven for hang gliders when on a windy weekend there would be almost 100 on the hill and 20 in the air at one time. Although sandy beaches and wind-blown dunes are the main attractions, the majority of the park is a hilly terrain heavily wooded in oak and hickory that in late October are brilliant with rich autumn colors. Providing access to much of the park is a network of eight marked trails which total almost 6 miles. 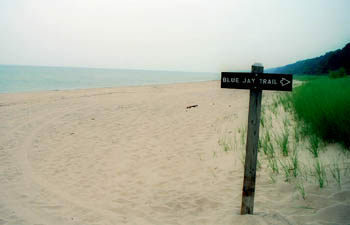 Three of the trails – Mt Randal Trail, Nature Trail, and Blue Jay Trail - along with a stretch of the shoreline form a 4-mile loop through the dunes in the park's interior, along Lake Michigan and back to a trailhead near the modern campground. 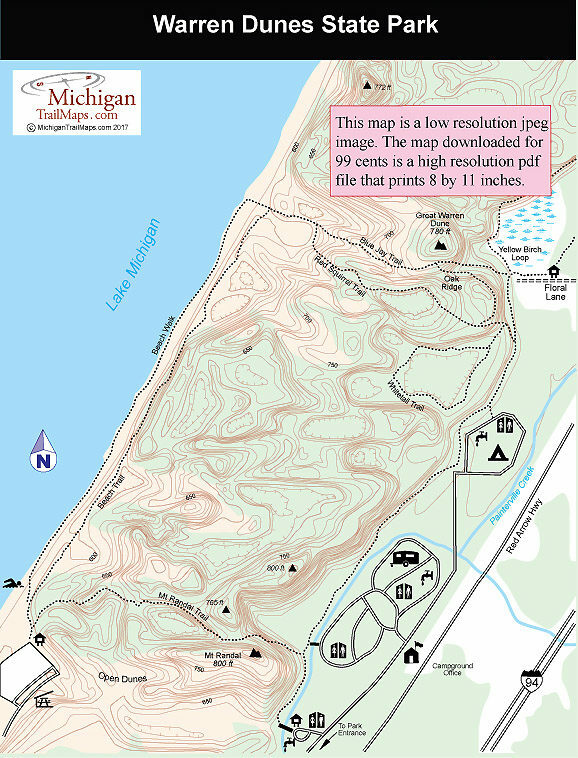 The trail passes through both wooded terrain and open dunes and can also be picked up from the northern parking lot of the day-use beach area, both the modern and rustic campground and a trailhead is located at the end of Flora Lane, north of the park entrance on Red Arrow Highway. Also beginning at the Flora Lane trailhead is Yellow Birch Loop and Golden Road Loop. Yellow Birch was originally built as part of the cross country ski system but after the park constructed a 400-foot boardwalk over a marsh, hikers began using the mile-long loop, especially in the spring when it is possible to sight a variety of birds. Finally, a popular hike in early spring is to simply walk the beach from the park's day-use area north to Weko Beach, a City of Bridgman park that adjoins the state park. At this time of year, the crowds are gone, the beach is hard for good footing and you can still enjoy the beauty of the dunes and deep blowouts. Round-trip to Weko Beach and back to the day-use area is a 5-mile hike. Warren Dunes has three campgrounds. A 182-site modern campground offers 50-amp electrical service, three Mini-cabins, a playground and a connection to the Mt. Randal Trail. At one time this was a wooded area of the park but due to an infestation of the Emerald Ash Borer beetle, more than 4,000 ash trees had to be removed, dramatically changing the appearance of modern campground. A quarter mile to the north is the park’s rustic campground with 36 sites, vault toilets and a path leading to the Nature Trail. Warren Dunes also has a group campground off Flora Lane. Separated from the rest of the park by several towering dunes is the day-use beach area of Warren Dunes. The area has parking for more than 1,500 cars but still fills up on weekends during the summer. Occasionally the park staff sets up overflow parking for an additional 600 cars before they start turning vehicles away. There are three bathhouse stores near the parking lots, much sand on the exceptionally wide beaches and the towering dunes nearby to climb. Warren Dunes is reached from I-94 by departing at exit 16 and following Red Arrow Highway south to the park entrance. Contact the Warren Dunes State Park headquarters (269-426-4013). You can reserve campsites or a mini-cabin through the Michigan State Park Central Reservation Service (800-44-PARKS; www.midnrreservations.com). For lodging or additional travel information contact the West Michigan Travel Association (616-246-2217; www.WMTA.org).